On the evening of November 6, a special evening gala of The Unforgettable Commemoration was held at London Hackney Empire Theatre to honour the memory of the Chinese Labour Corps of WWI. Chinese Ambassador Liu Xiaoming sent his message in writing, which goes: “Commemorating the historical contribution of the Chinese Labour Corps of WWI and writing a new chapter of China-UK friendship era”. The event was co-hosted by the UK Chinese Art Center and several overseas Chinese communities associations and was attended and addressed by Charge d'Affaires a.i. Zhu Qin. About 600 people watched the performance, including council leaders and mayors of the London Boroughs of Barnet, Bromley, Redbridge and Hackney, and MPs as well as friends from various sectors, descendants of the Chinese Labour Corps of WWI and overseas Chinese in the UK. Zhu noted in his speech that the Chinese Labour Corps of WWI have made indelible contribution to the cause of peace in Europe and the whole world. Today, a century on, to remember this part of the history is to tell the world that those historical lessons must be learnt, and that we must safeguard peace and oppose war. In the past century, thanks to the relentless efforts of generations of the Chinese people, China has found a development path that suits its national condition. Today, an increasingly prosperous China is making ever greater contribution to world peace, development and prosperity. Zhu expressed the hope that China and the UK as well as the rest of the world should bear in mind the history, face the future, and join hands to build a community with a shared future for mankind and to make new and greater contribution to world peace and development. 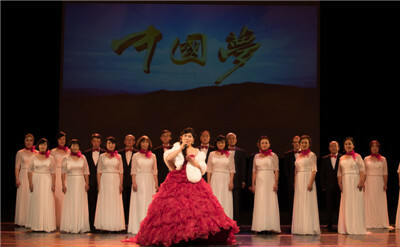 The Gala consisted of three parts, namely “Calling for Peace”, “Development Foundation” and “Common Home”, and reviewed the historical contribution of the Chinese Labour Corps of WWI , the development of China’s reform and opening up and China’s commitment to building a community with a shared future for mankind in the form of poetry reading, singing, dancing, piano solo, interviews and other artistic expressions. 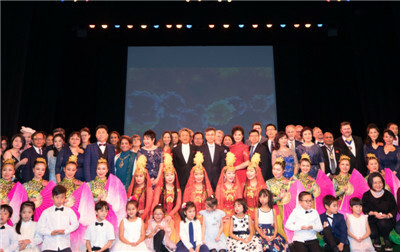 After the performance, Zhu met with the performers on stage, including National First-Class Performers Xu Tao and Wen Yujuan, overseas Chinese artists, staff of art communities and the teachers and students of Chinese language schools in the UK.